DrainCo Services services, repairs and installs new sump pumps to all of Evansville. DrainCo Services understands it is important that your sump pump is properly sized and installed correctly so that it can handle any kind of moisture that comes its way. They make sure that they install a sump pump that can withstand the demands of pumping water 24 hours a day, 365 days a year. If you have a sump pump that has always worked, you probably don’t appreciate it as much as you should. heavy thunderstorms are not only common but expected. During thunderstorms, high winds and lightning have a tendency to knock out power. Unfortunately, sump pumps don’t work without electricity. Ironically, the time you need your sump pump the most, may be the very time it doesn’t work. That’s why you need a Sump Pump Battery Backup system. A backup sump pump is designed to start working when your main sump pump stops. Or it can work in tandem with your main pump when the volume is extremely heavy. The battery backup even has an alarm that goes off if there are any problems with the battery, connections, or a clogged pump. After all, a backup sump pump system with a dead battery, loose cables, or a clogged pump is like having no backup at all. The backup sump pump protects against loss of power, primary pump failure, excessive water inflow and float switch failures. Lift the lid off the sump pit and slowly pour in water. The float should rise triggering the motor. The pump should run long enough to lower the water level and click off. If you add water and nothing happens, your pump may need service. Pumps may discharge to the sanitary sewer in older installations. Once considered acceptable, this practice may now violate the plumbing code or municipal bylaws, because it can overwhelm the municipal sewage treatment system. Municipalities urge homeowners to disconnect and reroute sump pump discharge away from sanitary sewers. Fines may be imposed for noncompliance. Many homeowners have inherited their sump pump configurations and do not realize that the pump discharges to the sewer. If the discharge is fed to a laundry sink in the basement, it’s likely going to the sewer. Usually hardwired into a home’s electrical system, sump pumps may have a battery backup. The home’s pressurized water supply powers some pumps, eliminating the need for electricity at the expense of using potable water, potentially making them more expensive to operate than electrical pumps and creating an additional water disposal problem. Since a sump basin may overflow if not constantly pumped, a backup system is important for cases when the main power is out for prolonged periods of time, as during a severe storm. A sump pump, either 1/3 or 1/2 horsepower (200 or 400 W), either battery or mains powered (or both). Automatic sump pump vs. a manual operation sump pump — Selection of a manual sump pump means that someone will turn the pump on and off when it is appropriate. Selecting an automatic sump pump means that a switch is wired to the sump pump to turn it on or off at appropriate water levels. Automatic switches include pressure switches, low level pressure switches and float switches. Power Needed — The Sump pump power will vary from 1/4 horsepower to multiple horsepower. The head pressure on the sump pump — The head pressure of a sump pump describes the maximum height that the pump will move water. For instance, a sump pump with a 15 ft maximum head, also called a shutoff head, will raise water up 15 ft before it completely loses flow. Technically, head pressure is defined as an expression of a pressure in terms of the height of fluid; P = yρg, where y is the fluid column height, ρ is fluid density and g is the acceleration of gravity. Other considerations may be added to overall head pressure, including loss from elbows/bends and friction loss from long horizontal runs. A 12 volt battery sump pump with its own water level sensor, piping, and check valve (the pipes usually join after the check valves to prevent reverse flow through the primary when the secondary unit is pumping). It must be a marine deep cycle battery, or long-life standby battery. Standard automobile batteries are not suitable for this application. Auto batteries are designed to deliver a high current for a short period. Sump pumps need a smaller, smoother current for a much long time. A trickle-charge battery charger can alternately have a specialized controller to manage, monitor and test that the battery is holding a charge. In Evansville, sump pumps must be maintained. Typical recommendations suggest examining equipment every year. Pumps running frequently due to higher water table, water drainage, or weather conditions should be examined more frequently. 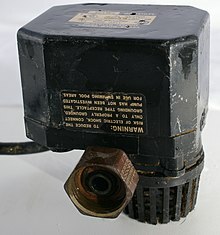 Sump pumps, being mechanical devices, will fail eventually, which could lead to a flooded basement and costly repairs. Redundancy in the system (multiple/secondary pumps) can help to avoid problems when maintenance and repairs are needed on the primary system. In Evansville, when examining a sump pump and cleaning it, dirt, gravel, sand, and other debris should be removed to increase efficiency and extend the life of the pump. These obstructions can also decrease the pump’s ability to drain the sump, and can allow the sump to overflow. The check valve can also jam from the debris. Examine the discharge line opening, when applicable, to ensure there are no obstructions in the line. Even a partially obstructed discharge line can force a sump pump to work harder and increase its chance of overheating and failure. Float switches are used to automatically turn the sump pump on when filled to a preset level. Float switches must be clear of any obstructions within the tank. A float guard can be used to prevent the float switch from accidentally resting on the housing, and remaining on.